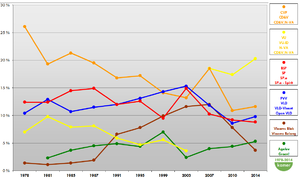 Colours denote the party receiving a plurality of votes per electoral canton * CD&V and N-VA were in a Cartel during the 2007 election; results shown for CD&V were for both parties during the 2007 election. Elections for the Federal Parliament were held in Belgium on 13 June 2010, during the midst of the 2007-11 Belgian political crisis. After the fall of the previous Leterme II Government over the withdrawal of Open Flemish Liberals and Democrats (Open VLD) from the government the King dissolved the legislature and called new elections. The New Flemish Alliance, led by Bart De Wever, emerged as the plurality party with 27 seats, just one more than the francophone Socialist Party, led by Elio Di Rupo, which was the largest party in the Wallonia region and Brussels. It took a world record 541 days until a government was formed, resulting in a government led by Di Rupo. Yves Leterme served as the caretaker prime minister of the country for the period that it had no official government. Following a continued lack of agreement over how to resolve the conflict over the electoral arrondissement of Brussels-Halle-Vilvoorde, the liberal Open VLD left the government on 22 April 2010, continuing the 2007–2011 Belgian political crisis. Prime Minister Yves Leterme (Christen-Democratisch en Vlaams, CD&V) immediately offered his resignation to King Albert II, who accepted it on 26 April 2010. Following the elections held on 13 June, there were fears that coalition-building may take so long that Belgium's presidency of the Council of the European Union, which starts on 1 July 2010, might have to start under a caretaker government. According to a statement by the Flemish President of the Constitutional Court, Marc Bossuyt, the elections might be ruled unconstitutional unless the Brussels-Halle-Vilvoorde arrondissement is split up beforehand. On 4 May, all but one Flemish judge-president of the 13 Flemish Courts of First Instance wrote a collective letter, saying that the elections cannot be held with the current electoral districts and that a return to the previous electoral arrondissements is necessary. In contrast, Ghislain Londers, the president of the Court of Cassation declared that all judges are obliged to cooperate with the electoral process. Before the judges' letters, former president of the Belgian Chamber of Representatives Herman De Croo stated that no court could prevent the elections from taking place. The international media saw the election as crucial to determine the future of the country, even though it was admitted that devolution would not happen immediately. The parliament was dissolved by Declaration of Revision of the Constitution on 7 May 2010 and elections were called by royal order of the same day. The period with rules and limits on campaign spending (sperperiode), which normally runs three months prior to election day, started that day. Voting occurred on Sunday 13 June 2010 between 08:00 and 13:00 in polling stations with paper ballots, and between 08:00 and 15:00 in those with electronic voting. The newly elected parliament was to convene on 6 July 2010. The primary six Flemish political parties and their results for the House of Representatives (Kamer). From 1978 to 2014, in percentages for the complete 'Kingdom'. These Flemish parties field candidates in the regions of Flanders and the partially bilingual electoral district Brussels-Halle-Vilvoorde. New Flemish Alliance (Nieuw-Vlaamse Alliantie, N-VA) – centre-right political party, seeking secession of Flanders. Christian Democratic and Flemish (Christen-Democratisch en Vlaams, CD&V) – Christian democratic party with historic ties to both trade unionism and corporative organizations. Socialist Party – Differently (Socialistische Partij – Anders, sp.a) – social-democratic party. Open Flemish Liberals and Democrats (Open Vlaamse Liberalen en Democraten, open-VLD) – liberal party. Flemish Interest (Vlaams Belang) – seeking the independence of Flanders and strict limits on immigration. Green! (Groen!) – green political party. List Dedecker (Lijst Dedecker) – conservative-liberal party. These Francophone parties fielded candidates in the region of Wallonia and in the electoral district Brussels-Halle-Vilvoorde. Socialist Party (Parti Socialiste, PS) – social-democratic party. Reformist Movement (Mouvement Réformateur , MR) – liberal party. Humanist Democratic Centre (Centre Démocrate Humaniste, CDH) – Christian democratic party. Ecolo – green political party. People's Party (Parti Populaire) – conservative-liberal party. Leterme stepped aside on 28 April 2010 and was replaced as leader of CD&V by Marianne Thyssen. Rik Torfs, former canon law professor at the Catholic University of Leuven, was on the Senate list for CD&V. Siegfried Bracke, former political analyst at the Flemish public broadcaster VRT was first on the Chamber list in East-Flanders for N-VA.
Eva Brems, human rights professor at Ghent University and former president of the Flemish division of Amnesty International. She was head of the Chamber list in Flemish Brabant for Groen!. As of May 26, it appeared that the major development in the election was the surge in popularity of the N-VA in Flanders. Led by Bart De Wever, it supports eventual independence for Flanders, and an immediate switch from a federal Belgium to a confederal Belgium. The N-VA replaces the CD&V of outgoing PM Yves Leterme as the most popular party in Flanders. This development opens the question of how the francophone parties might react to forming a government with an openly sovereigntist, but politically centrist party if they do win a plurality of votes in Flanders. It appeared that the N-VA had attracted some popularity from the ethnic nationalist party, Vlaams Belang. After polls showed the N-VA receiving 29% of votes in their region, media interpreted the election as a "victory for Flemish independence". The following tables contain percentages on the national level (i.e. the result of N-VA is 17.4% on the national level, while it is 27.8% on the regional level). Source: Federal Portal − Chamber Elections 2010. 2) * = Christian Democratic and Flemish and the New Flemish Alliance contested the 2007 elections together, receiving 18.51% of the votes and 30 seats. Source: Federal Portal − Senate Elections 2010. Notes: * Christian Democratic and Flemish and the New Flemish Alliance contested the 2007 elections together, receiving 19.42% of the votes and 9 seats. These maps depict the largest party in each constituency. Candidates receiving the highest number of preferential votes. On possible coalitions, election winner Bart De Wever announced he would seek negotiations with the Francophone Socialist Party. The Socialist Party leader Elio di Rupo was tapped to become the next Prime Minister, because the socialist parties emerged as the largest "party family" in the elections, and because the New Flemish Alliance lacks a Francophone counterpart. Philip Blenkinsop of Reuters stated that the win of the New Flemish Alliance could have negative effects because "Belgium can ill afford drawn-out coalition talks because it has a large debt and any policy paralysis could make the country vulnerable on financial markets that are closely watching a sovereign debt crisis." Coalition formation continued for a record breaking 541 days, with a government under Elio De Rupo eventually being formed on 6 December 2011 after agreement was reached on the 2012 budget. The Di Rupo I Government includes the Liberal, Socialist and Christian Democratic parties from both Flanders and Wallonia. The government excludes the New Flemish Alliance (N-VA), the Greens of Groen and Ecolo, the right of Vlaams Belang, the Lijst Dedecker and the People's Party. N-VA's absence, together with the unwillingness of Open Vld to enter into an eight-party coalition that included the green parties, means the government coalition lacks a majority in the Dutch language group. It is the first time that the Belgian prime minister has been openly gay and the world's first male openly gay head of government Belgium is thus the second European country to have a homosexual prime minister, after Iceland (Jóhanna Sigurðardóttir). Elio Di Rupo is the first native French-speaking prime minister since 1979 and the first Walloon prime minister since 1974. ^ "It's a June 13th election". deredactie.be. 2010-05-05. Archived from the original on 2010-05-14. Retrieved 2010-05-06. ^ Zuvela, Matt and Connor, Richard (13 June 2010). Party supporting Belgian division claims election victory. Deutsche Welle. Retrieved 14 June 2010. ^ Mulvey, Stephen (2011-06-13). "Life without government, the Belgian way". BBC News. Retrieved 2018-01-31. ^ "Belgium's government falls, future unity on line". Montreal Gazette. 2010-04-26. Archived from the original on 29 April 2010. Retrieved 2010-05-01. ^ "Belgium's king accepts government's resignation". Irish Examiner. 2010-04-26. Retrieved 2010-05-01. ^ "Belgischer König akzeptiert Rücktritt von Regierungschef" (in German). Nzz.ch. 2010-04-26. Archived from the original on 29 April 2010. Retrieved 2010-05-01. ^ "Regierung Leterme endgültig gescheitert" (in German). Derstandard.at. 2010-04-26. Archived from the original on 29 April 2010. Retrieved 2010-05-01. ^ "Verkiezingen 2009 ongrondwettelijk zonder oplossing BHV" (in Dutch). De Morgen. 2007-11-13. Retrieved 2007-11-14. ^ "Geen verkiezingen zonder oplossing BHV" (in Dutch). Vrtnieuws.net. 2007-11-13. Archived from the original on 14 November 2007. Retrieved 2007-11-13. ^ "Zonder oplossing BHV geen grondwettelijke verkiezingen" (in Dutch). De Standaard. 2007-11-13. Archived from the original on 14 November 2007. Retrieved 2007-11-14. ^ a b "Marc Bossuyt entame sa présidence en force" (in French). La Libre Belgique. 2007-11-14. Retrieved 2007-11-14. ^ "Rechters hebben de plicht mee te werken aan verkiezingen" (in Dutch). Hbvl.be. 2010-05-04. Archived from the original on 7 May 2010. Retrieved 2010-05-06. ^ "Unity at stake in Belgium vote - Europe". Al Jazeera English. Archived from the original on 15 June 2010. Retrieved 2010-06-15. ^ "Belgians vote as breakup looms". Presstv.ir. Archived from the original on 16 June 2010. Retrieved 2010-06-15. ^ "Belgian leader steps aside, early election ahead". foxnews.com. Associated Press. 28 April 2010. Retrieved 28 February 2019. ^ Jean Quatremer (2010-05-26). "Belgique: les indépendantistes flamands ont le vent en poupe" (in French). Liberation. Archived from the original on 28 May 2010. Retrieved 2010-05-26. ^ Auteur: loa (2009-04-30). "De Standaard Online - N-VA tweede grootste in peiling La Libre-RTL". Standaard.be. Retrieved 2010-06-15. ^ "Belgique: victoire large et historique des indépendantistes flamands - Libération". Liberation.fr. Archived from the original on 15 June 2010. Retrieved 2010-06-15. ^ Keine Lösung des Sprachenstreits in Sicht. No solution for language dispute Archived 2010-06-16 at the Wayback Machine (in German). orf.at. Retrieved 14 June 2010. ^ Fallon, Amy (14 June 2010). Belgian election win for party that wants to split nation. The Guardian. Retrieved 14 June 2010. ^ Erdrutschsieg für flämische Separatisten. Landslide victory for flemish separatists (in German). Der Standard. Retrieved 14 June 2010. ^ Belgian elections: who could be next prime minister?. The Daily Telegraph. Retrieved 14 June 2010. ^ Blenkinsop, Philip. "Separatists claim victory in Belgian election". Leaderpost.com. Archived from the original on 19 June 2010. Retrieved 2010-06-15. ^ Jackson, Patrick. "Profile: Belgium's Elio Di Rupo". BBC. Retrieved 8 December 2011.